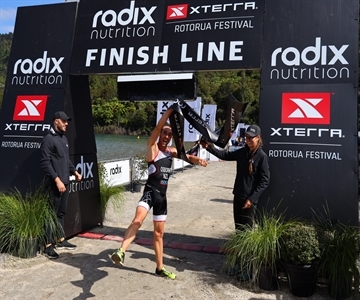 It’s the third year in a row Osborne and Allen have won this race, and the fourth time for Allen on the top step in Rotorua dating back to her first-ever XTERRA win here in 2012. In the men’s race Osborne, Ryan Sissons, and Ben Allen set the pace in the swim but as soon as it got to the bike it was all Osborne. Osborne had about 1:30 on the speedy Sissons heading into the run, which would prove to be more than enough. He crossed the line in 2:02:36, having posted the fastest swim, bike, and run times of the day. Sissons came in second nearly two-minutes later. Sissons, a two-time Olympian racing in his first-ever XTERRA, and Osborne, the reigning and two-time XTERRA Asia-Pacific Tour Champion, know each other well having trained extensively together through the years, most notably in the run-up to the 2016 Rio Olympics where Sissons finished 17th. For Sissons, his introduction to XTERRA couldn’t have gone much better. Another local Rotorua kid, Olly Shaw, caught Ben and Ryan about halfway around the bike after Sisson dropped his chain on a downhill, but the Olympian was able to catch back up and get ahead of those two by T2. “Finishing second here to Sam is pretty good, because he could ride around that course blindfolded,” said Sissons. Shaw, a long-time XTERRA racer who won the 20-24 division World Title back in 2012, is focusing on road tris this year but was happy to mix it up today. Shaw held on for third with Ben Allen in fourth and Lewis Ryan rounding out the top five.